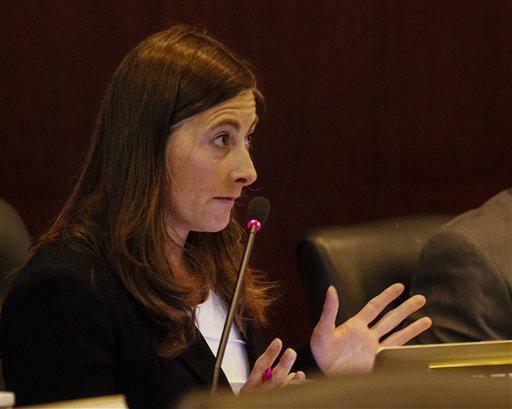 UPDATED: Mon., Feb. 26, 2018, 6:28 p.m.
Rep. Heather Scott says she has an answer to school shootings: More retired law enforcement officers carrying concealed guns when they pick up their grandchildren from school. Scott proposed one of four bills dealing with guns that were debated in the Idaho Legislature on Monday; all dealt with gun rights or gun safety, not gun control. Two of the others dealt with “stand your ground” laws; and one encourages Idaho schools to offer optional gun-safety courses for students. Scott’s bill would add three more places where retired law enforcement officers could carry concealed guns in Idaho where that’s not permitted now: In K-12 schools, and in student dormitories or large stadiums on public college or university campuses. The committee endorsed Scott’s bill on a unanimous vote; it now moves to the full House. Scott said the idea was brought to her by a member of the Fraternal Order of Police, and she has support for it from the Idaho Sheriffs Association and the Idaho Chiefs of Police Association. The Senate State Affairs Committee backed Sen. Todd Lakey’s “castle doctrine” and “stand your ground” bill on a party-line vote, after more than two hours of testimony, with just two minority Democrats dissenting. Lakey, an attorney, said Idaho has had those policies in case law for 100 years, and the bill simply writes them into state law. Lakey said his bill was developed in consultation with prosecutors, law enforcement, and Idaho legislators with experience and expertise in legislation regarding the 2nd Amendment. Most of the more than 30 people who testified on the bill opposed it, saying it would encourage people to “shoot first and ask questions later.” An NRA representative, Keely Hopkins, spoke in favor of the bill. Others said they didn’t believe the bill went far enough to protect self-defense rights. After the House State Affairs Committee had concluded its business on Monday, Rep. Christy Zito, R-Hammett, made a motion to hold a hearing on her farther-reaching stand-your-ground bill. Committee Chairman Tom Loertscher, R-Iona, said his intention was to wait until the Senate bill arrives in the House and hear both measures together. Rep. Ron Nate, R-Rexburg, pitched his bill to encourage public schools in Idaho to offer optional classes on gun safety to the House Education Committee on Monday. The panel approved the bill on a party-line vote, with its three minority Democrats dissenting; the bill now moves to the full House. Nate said the move would help familiarize kids with guns so they’d be less likely to be involved in accidental shootings. “We teach all sorts of safety in our schools,” he told the committee. Two people spoke in favor of the bill and two against. The measure now moves to the full House. Published: Feb. 26, 2018, 2:02 p.m. Updated: Feb. 26, 2018, 6:28 p.m.